« Can a high fibre diet REALLY help prevent Type 2 Diabetes? What if sugar DOES play a role in developing Type 1 Diabetes? Whenever we hear or see articles talking about diabetes being a consequence of poor dietary habits and lifestyle – typically involving high calorie sugary foods, lack of exercise, and obesity – we are almost guaranteed to hear or see a response from someone objecting that this isn’t the case for people with Type 1 diabetes. Indeed we see regular calls for Type 1 and Type 2 to be more clearly differentiated, basically so that people living with Type 1 are not stigmatised as being fat and lazy. Historically, Type 1 has been thought of as being a purely genetic disease, usually affecting children and young people. Latterly we’ve started to see a surge in older adults being diagnosed with this type of diabetes, and research is exploring the possibility of viral causes. Certainly no finger has been pointed at sugar as a causal factor for Type 1 diabetes – until today! With any gene-related illness it’s the gene expression, the switching on of the gene, that is the crucial factor in someone developing the disease. Just for a moment let’s think of breast cancer. We know that not every woman who owns the breast cancer gene will go on to develop breast cancer. So far we’ve treated the likelihood of going on to develop the breast cancer almost as a lottery. Because no-one can predict with any certainty which women will go on to develop the cancer, some are motivated to elect preventative mastectomy. No-one can predict the outcome for any individual woman because we haven’t yet identified what switches on the gene – in other words what causes the breast cancer gene expression. A whole new field of science, called epigenetics, has opened up to explore the triggers for gene expression. So back to diabetes. Type 1 diabetes certainly has a genetic component – there is a gene that is linked with Type 1 diabetes. But what causes that gene to be expressed, or switched on? In a new article it is, perhaps for the first time, hypothesised that sugar could be one factor that takes a young person from being at risk of Type 1 diabetes – having the gene linked with the disease – to actually developing the disease. If this is shown to be the case, this new knowledge will be a game-changer! For the first time people living with Type 1 diabetes may have to face the fact that their condition is indeed, at least in part, linked with diet. Less directly than for people with Type 2 diabetes maybe, but linked nonetheless. And it will be another nail in the coffin for sugar! I’ve blogged before that people with Type 1 diabetes need to be cautious of excessive consumption of carbohydrates and sugary foods, and should treat their diet with the same consideration as recommended for those with Type 2 diabetes. 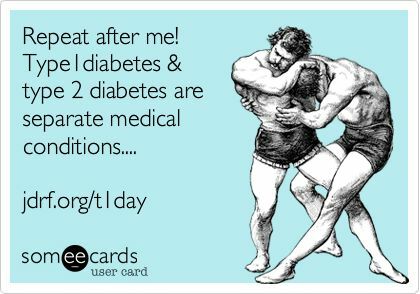 Indeed, RebalanceDiabetes has been shown to work effectively for clients with both types of diabetes. I’m certainly watching this particular space with interest! This entry was written by rebalancediabetes, posted on June 9, 2015 at 5:00 pm, filed under Uncategorized. Bookmark the permalink. Follow any comments here with the RSS feed for this post. Post a comment or leave a trackback: Trackback URL.